How much money do you have to spend to get a manufacturer to throw in a $650 freebie? Well, it looks like a cool $3,000 $1,500 is a start. At least, that's the math behind an upcoming Samsung promotion an anonymous tipster shared with us. 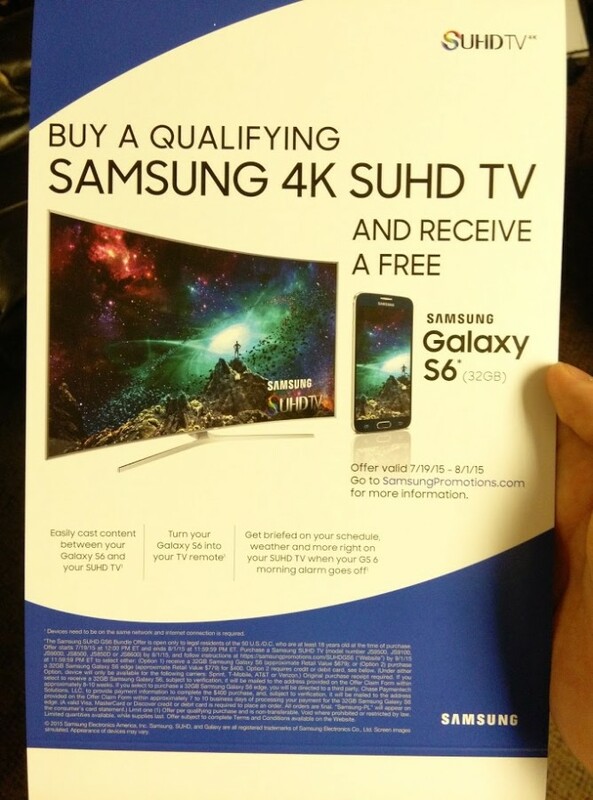 According to the leaked marketing pamphlet, with "select" purchases of Samsung SUHD TVs, buyers receive a free 32GB Galaxy S6. This replaces the current promotion, which gives buyers a free year of Netflix. After it expires on July 18th, the free S6 promo kicks off on July 19th and lasts until August 1st. Take note that this applies only to SUHD TVs, not just any Samsung 4K TV. The "S" in SUHD doesn't actually stand for anything and is not an industry standard. What it does entail is "nano-crystal" color technology that is indeed an upgrade over the standard LCD offering as well as what amounts to an HDR feature that improves contrast for content that supports it. Those are all of Samsung's current SUHD models except the very cheapest, the JS7000. With that said, the 48" JS8500 is discounted heavily to $1,499 at Samsung's website and Amazon right now. We'll see if it stays that way once the promo launches, otherwise the cheapest would be the JS9000 at $3500. The preferred method for collecting your gift is to head to a soon-to-be-live link at SamsungPromotions.com, filling out a form, and waiting up to 8-10 weeks for the free phone to arrive. There is no option described to upsize the storage, even if you're willing to pay. 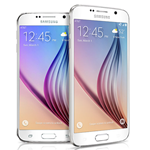 If you want an S6 Edge, though, there is an opportunity for that. You can buy the S6 Edge yourself through a carrier and get reimbursed such that you are only on the hook for $400. Since it only retails for $100 more, it's a far worse deal to redeem this offer for the Edge. Feel free to speculate about what this has to say about the relative sales of those two models. Since it hasn't been formally announced yet, details may change. But considering that they have printed these flyers, the terms probably are as explained here. The promotion has gone live as of Sunday, July 19th. All of the models listed above are supported with a free 32GB Galaxy S6. Click here to get the details and apply.